When I replaced all the networking cables and equipment in the house, I opted to use 7' cables for patch cables between the equipment and the individual computers. Some of them previously had 3' cables, and one even had a 1' cable, and while these worked fine there really wasn't any slack to move things around at all. I figured 7' was an optimal size because it was short enough to not be too unwieldy, but long enough to allow flexibility in placement. To that end, I purchased six of these Rosewill 7' Cat 6 Network Cable. The cable modem is has one of these connecting it to the wireless router, and then the router has two more of them connecting the individual computers in the main room. I also have a 25' cable snaking across the ceiling into the other room and into a network switch, where two more of these 7' cables connect the individual computers in that room as well; the remaining cable I threw in my box of cables for a spare. Since the 25' cable I used (RCW-565) is black in color, I opted for the RCW-580 grey ones for the 7' patch cables so that I could tell at a glance whether the cable I was removing was a long run or a patch cable. The black version of this 7' cable is RCW-562 if you would rather have them match. Like it's older 25' brother, the 7' cable came in a sealed foil and plastic bag and was wound into a coil to prevent kinking. 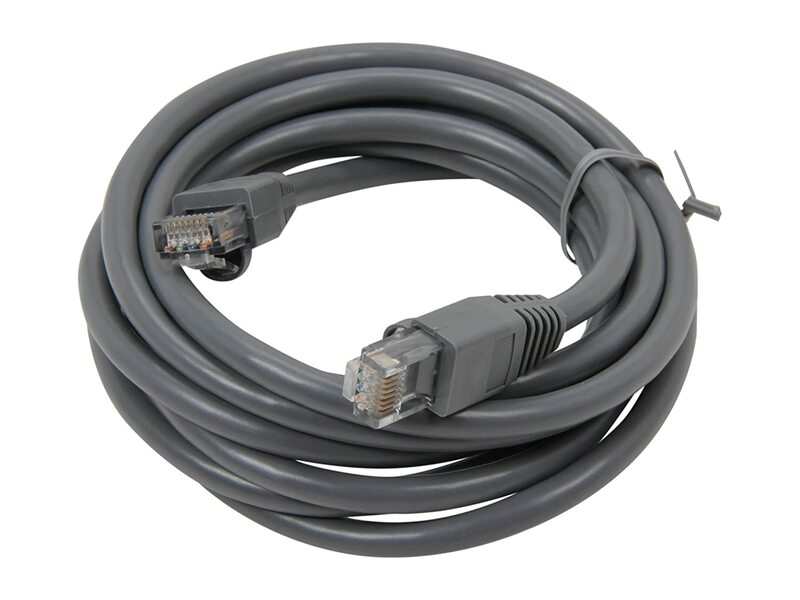 Cat 6 cables are backwards compatible with Cat 5/5e applications, so they can be swapped right into existing networks without messing anything up. They have reduced impedance, crosstalk and structural return loss due to typically using larger twisted wire pairs (22 AWG as opposed to 24 AWG for Cat 5 cables). I noticed these cables weren't quite as flexible as most of the Cat 5 & 5e cables they replaced, but they were still plenty flexible enough and I had no issues routing them. Network speeds are the same as before, with the hard drive being the limiting factor in transferring across the local area network and the terrible 1.5mbitcable being the limit over the internetfor me. I went with 10/100 BASE-T networking, but this Cat 6 cable would work just as well for GigabitEthernet if I had chosen to go that route. It meets all EIA/TIA Cat 6 TIA/EIA- 568-B-2.1, draft 9 standards and has a gold-plated RJ-45 male standard connector on each end. This cable also has the little rubber protective things covering the clips on the connectors at the end that I really don't like. Others may like them as they do prevent snagging and breaking the clip off, but I'm typically a little more careful with my cables. The only time I've broken the clips off have been when they got snagged while buried loose in my extra cable box. I chose to cut the rubber covering off the ends of all my cables with a pair of wire cutters and call it a day. I'm perfectly happy with these 7' cables and the 25' cables I purchased, and they (at the time of this writing) only cost $2.49 on Newegg with free shipping. They also typically have volume discounts for ordering multiple cables, and while it's not a large discount it's never a bad thing to save money if you need multiple cables like I did anyway. An easy recommendation.